Back when I got my Roubo Frame saw kit from Bad Axe Toolworks, I also got the kerfing plane kit. I finally got around to finishing that this morning, and have put it to use. With the kit you get a saw plate and a cherry board. Step one is cutting a hand-hold in the board. A couple different spade bits, some connect-the-dots with a coping saw, and some smoothing with rasps and files and I had that done (pictures two and three). Next was cutting a rabbet for the fence. Two saw cuts, and a little cleanup with a rabbet plane, and that was done. Since I’m mostly after 1/4 to 3/8 thick stock at the moment, I decided to make my fixed fence with a 3/8” kerf. So I clamped a couple 3/8×3/16 brass bars to the fence, and sawed right next to them with my pull saw. As it’s just barely long enough, I had to start the kerf on one end, other, and then bring down the middle until it was level. That’s the fourth and fifth pictures. Drill a few holes, and put in the saw plate with the provided saw nuts (much easier said than done), and I had a completed kerfing plane, as shown in the first picture. The final picture shows a 1/2” deep kerf I cut in a poplar board to test things out. Looks pretty good! Forgot to mention that the top of the plane is completely unshaped at the moment. The tool works, and I’m calling it “done” but I’ll eventually carve a handle into the top of the plane. But not until I’ve used it a bunch and have figured out where my hands want to be. It’s entirely possible I’ll end up deciding the hand-hold at the back of the plane needs to be reworked, too. Time will tell. No point in “fixing” the tool until I know what’s wrong with it in its current form. Nice Dave. Not likely to see me re-sawing by hand but I’d definitely want one if I was! Yeah. I find that my cut will wander all too easily if I don’t have a kerf to follow. I’m sure it’s a technique thing that I’ll get better at with practice, but for now the training wheels are a big help. Good work, Dave. Now on to one with a movable fence! Eventually, Ron. For now, I’ve got a bunch of projects that need either 3/8 or 1/4 stock, so the fixed fence should give me plenty to keep busy with. I might build another with a different fixed fence before converting one to a movable fence. Depends how my wooden-screw-making project goes. Yeah, Gary. I started last October and had a couple months off, plus I have a very understanding sweetie. Also, part of the plan is that I want to have a pretty well equipped hand-tool shop by the time I retire, so I don’t have to buy tools on a fixed income. So I’m buying and building a lot of tools now. And between that and the swaps, I’ve got a lot to keep me busy and learning new stuff. First successful resawing using the frame saw and kerfing plane. 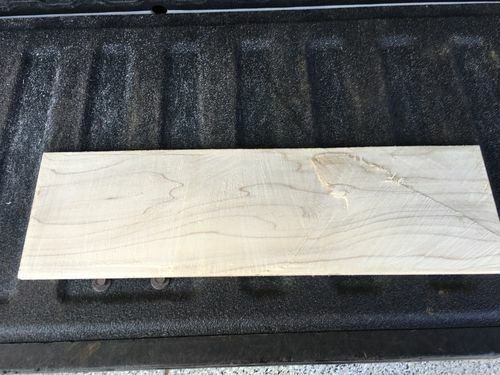 I cut a 7×24x3/8 piece off a 7×24x7/4 piece of poplar. Only wandered about a sixteenth where the three saw cuts met up.